Have your kids join together to work on these abc worksheets. 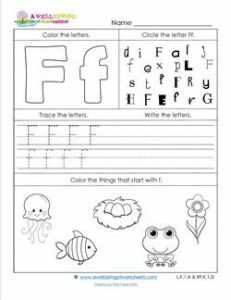 In this particular worksheet, they can help each other find the letter f among all those letters of different fonts. They can work together to figure out which objects start with the /f/ sound. Who is going to color the letter f in orange or green or blue? Your kids can discuss all these details, too while reinforcing letter skills with the different activities on this page.